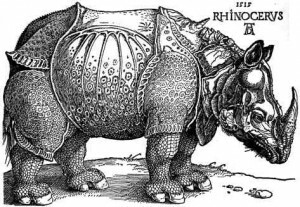 Richard Elwes has a fun blog post this morning: Dürer, rhinos, and snowflakes. The post is primarily about the art and mathematics of Albrecht Dürer (1471-1528) but also includes some related links to recent writings, such as Michael Croucher’s blog post on snowflakes. He lived for 257 years (1471-1728) ? Oops! Thanks for letting me know about the typo. The 500 th anniversary of Durer’s 1514 magic square approaches. Check out the 14 x 14 magic square tribute on the Associative Magic Square wiki.